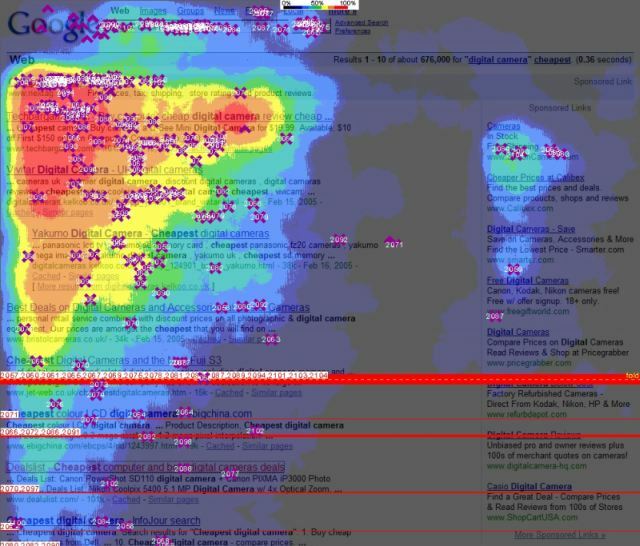 SEO vs. PPC – Data, Heat Maps, n Search OH MY! So you have a website. You want more traffic. You can’t decide what type of traffic is right for you. Seems pretty common. You have heard about SEO. You have heard about PPC. But you ask yourself, which one is better? Good question. There isn’t a concrete answer that applies to all companies or situations. However, I will give you some empirical evidence to help you out. First, let me say that I know SEO. I also know PPC. I got into this industry through PPC. I lost a lot of money in PPC, just like you can in ANY form of marketing if you don’t know what you are doing. Now, one to the research and data…. In terms of raw dollars spent on search engine marketing activities, according to SEMPO, 11% of search engine spending is for SEO and 87% is for PPC. According to Comscore, clicks on paid search results has gone down over time, and are now around ~22%. If you are confused, don’t be. Just start doing more SEO while all of your competitors keep pumping their money into PPC.